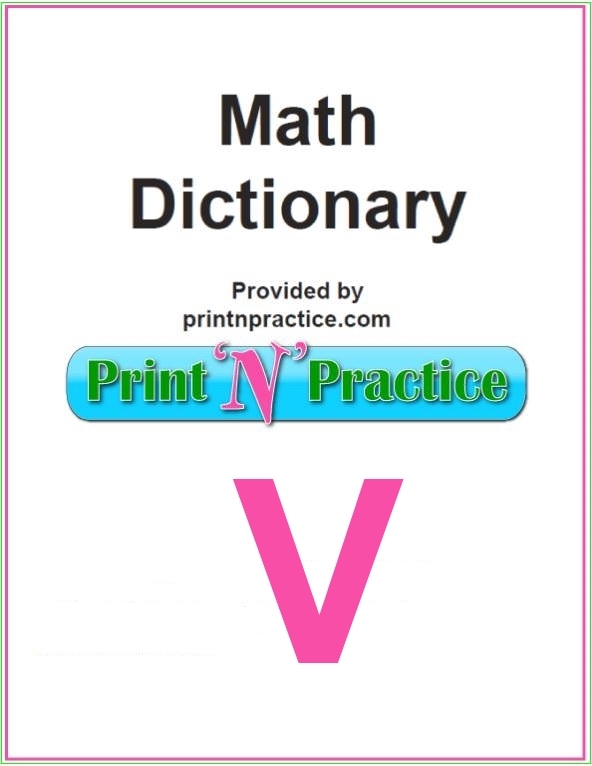 This is our page for the Math Dictionary words that start with V words. 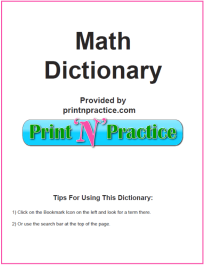 The whole printable Math dictionary is below - short and sweet. 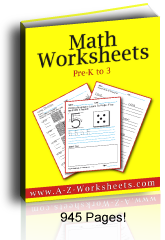 Math Words that start with V: Does your glossary have these? Variable - a symbol whose value can change. Vector - a ray that has a magnitude and a direction. Vector Space - the three dimensional area where vectors can be plotted. Velocity - the rate of change of position over time is velocity, calculated by dividing distance by time. Venn Diagram - a diagram where sets are represented as simple geometric figures, with overlapping and similarity of sets represented by intersections and unions of the figures. Vertex - the corners on a polygon. Vertical - a line that goes up and down and is perpendicular to the horizon. Vertical Angles - the two nonadjacent angles formed when two straight lines intersect. Vertical Line - a line that runs up and down and is perpendicular to a horizontal line. Vigesimal - related to intervals of 20. Vinculum - the horizontal bar in a fraction separating the numerator from the denominator. Volume - a measure of the number of cubic units needed to fill the space inside an object, length x width x height = volume therefore the units are cubed. Vulgar Fraction - a common fraction.